Refrigerators that have earned the ENERGY STAR are about 15% more energy efficient than models that meet the minimum federal energy efficiency standard. ENERGY STAR certified refrigerators are required to use about 15% less energy than non-certified models. Choose a new certified model rather than a standard model and cut your energy bills by more than $80 over the lifetime of your fridge. An estimated 170 million refrigerators and refrigerator-freezers are currently in use in the United States. More than 60 million refrigerators are over 10 years old, costing consumers $4.4 billion a year in energy costs. By properly recycling your old refrigerator and replacing it with a new ENERGY STAR certified refrigerator, you can save from $200–$1,100 on energy costs over its lifetime. Use the ENERGY STAR Savings Calculator to find out exactly how much money you'll save by replacing your existing refrigerator. Nearly 70% of U.S. electricity is generated with coal and natural gas, which release greenhouse gasses into the atmosphere and contribute to climate change. ENERGY STAR certified refrigerators use less energy and help us reduce our impact on the environment. If everyone purchasing a refrigerator this year chose a model that has earned the ENERGY STAR, together we would save 715 million kWh per year and reduce greenhouse gas emissions equivalent to those from about 100,000 cars. 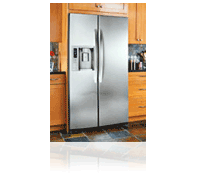 Refrigerators originally qualified for the ENERGY STAR label in June 1996. ENERGY STAR qualified refrigerators are 15% more efficient than non-qualified models and are 20% more efficient than models that simply meet the federal minimum standard for energy efficiency. Use this label to determine the model's energy use, compare the energy use of similar models, and estimate annual operating costs. Learn How to Use the EnergyGuide Label . Models with top-mounted freezers use 10�25% less energy than bottom-mount or side-by-side models. Generally, the larger the refrigerator, the greater the energy consumption. The most energy-efficient models are typically 16�20 cubic feet. Automatic ice-makers and through-the-door dispensers increase energy use by 14�20%. They also raise the purchase price by $75�250. These are the top FAQs related to Refrigerators and the ENERGY STAR program.